This article provides step-by-step instructions for installing Cinelerra 4.4. 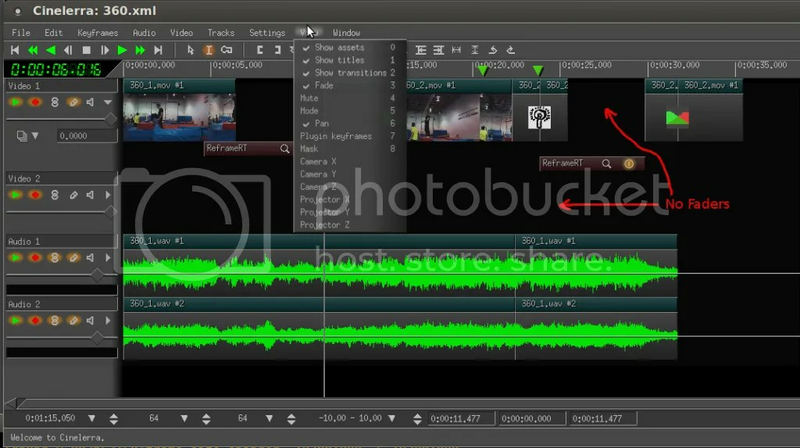 I upgraded my main workstation to Ubuntu 12.04 recently, briefly looked at PiTiVi and decided that Cinelerra is still the only capable video editor for Linux, despite its many flaws. This post provides step-by-step instructions for compiling and installing Cinelerra 4.4. Here is the list of dependencies that I know about. At a minimum you’ll need these packages, although there may be more. If the compile fails on a dependency, simply look at the last few lines of the output and the error should tell you what it’s missing. You will need to apply two patches from the Community Version of Cinelerra to add dnxhd and dv50 codec support and YUV Stream support. This was easy, b/c the patches applied cleanly. Once I import output.mov into Cinelerra, I delete the audio tracks and I replace them with sound.wav, which work well. Aside from some new features here and there, the most obvious advantage of Cinelerra 4.4 over the Community Version is that the video processing and playback appears to be faster. I get about 10 FPS in cinelerra-cv, whereas Cinelerra 4.4 gives me 20 FPS, which makes the video manipulation and playback much smoother. Nice. Aside from some minor problems, like missing icons for transitions and other resources, the most severe problem I ran into was the missing Fader line in video tracks. The audio tracks still had the Faders, but in Video tracks the horizontal white line was just gone. If this happens to you, the fix is to press the 3rd button from the right in the tool bar. It is called “Fit autos to display (Alt + f)”. What it will do is change the fade range in the drop down at the bottom from “-10.00 – 10.00” to something like “-33.00 – 133.00” in my case. You can also select “0 – 100” from that drop down as an alternative. So, third party speech tools? What is this? I did not have the issue you describe, so I can’t give you a ready to use fix, but I have some ideas. Let me know if this works for you, so I can update the post with the info. Good luck. Hello valblant, I tried to compile cinelerra HV 4.4 following your instructions on my Debian Wheezy amd64 and I had the same issue as Micheal. But I found a solution. Just use the third patch on http://renomath.org/video/linux/cinelerra/ by Eric Olson : patch-cinelerra-4.4-gcc47 and everything will be ok. Then launching cinelerra we have another little flaw: MWindow::init_theme: theme Blue Dot not found. So that, following http://git.cinelerra.org/irclog/index.php?file=2005-11-29.html open ~/.bcast/Cinelerra_rc find the line that starts with THEME and delete it. Hope it will help you all. Cheers! This is parts on festival speech synthesis system. I just deleted speech tools and festival from the cinelerra source subdirectory because it’s already present in linux distribution. Thank you, Mr. Plinsksy. Good stuff! Interesting. Can you post the full listing of your bin/ directory? Are you sure there were no errors? Try running ‘make -C cinelerra’ from the root directory. Does that run successfully? Hi, tried compiling cinelerra 4.4 last month, but had a missing dependency and make errors on Debian wheezy 7.1-amd64. That was after adding the patches. So I ended up installing the deb from deb-multimedia.org. Which isn’t patched and has no stream output option. It is rock stable I’m no longer saving and restarting every 15 minutes. Well still saving. Rendering issues: h264 produces just gray video with some blobs here and there. YUV420p in mov container looks great, but ffmpeg says a bunch of the frames are bad. Listing thousands of errors in just seconds. Had scrolling set to 5000 lines & it ran past that before I hit quit. RGB comes out looking like the colors are swapped around, BGR, maybe. I would just like to render mov using h264 & aac. I have a 480p yuv420p project, I’d like to render & I don’t want to render it to a lossy format then transcode to h264 aac .mp4. Any advice? Thanks. Is that the source of the problem? Thanks for the grate job. I have the same issue as Richard. Anyone have any ideas? Version issue with libfaac?